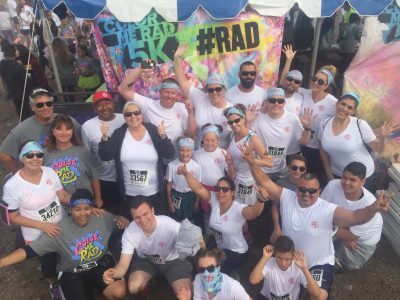 Health & Wellness: A-C Electric Company sponsors employees to participate in local area events such as Color Me Rad, Mud Factor Run, and more – we even get matching shirts! A column dedicated to healthy living can be found in each edition of the company newsletter. Collectible Pins: We create collectible trading pins for every A-C event; Christmas Parties, fun runs, picnics, select training. To each event we wear our pins and trade with others in an effort to obtain a full set. 70 Years and Counting: In January 2016 the firm celebrated our 70th anniversary by taking every employee and a guest to Cambria, Calif. for the weekend. The event included daytime excursions, a dinner-dance party, and hotel accommodations at the Cambria Pines Lodge. Longevity: Our staff turnover rate is practically non-existent. Folks stay and grow at A-C for years, in fact we have 2nd and 3rd generation families working at the firm. Newsletters & Social Media: Regular posts are updated to our company Facebook, LinkedIn, and Instagram pages celebrating milestones of the firm, our team and their families. In addition a quarterly newsletter is printed and mailed to homes with information such as home safety, health and wellness, current job openings, featured projects and more. Integrity – Operating with uncompromised honesty and character. Quality – Providing best-in-class workmanship, systems and processes, while maintaing value for our customers. Professionalism – Treating our customers and coworkers with the respect that they deserve and diligently working to meet our commitments to both. Knowledge – Valuing ongoing training and the pursuit of knowledge to allow us to provide advanced, turnkey solutions to our customer’s needs. Safety – Considering safety in everything we do and striving to achieve a zero accident rate. Service – Consistently exceeding the expectations of our customers and coworkers with unparalleled responsiveness, dependability and attention to detail. Family – Fostering a work environment that recognizes the importance of family and the balance between work and family. Community – Generously giving back to the communities in which we do business. Desire – Having the “want to” to make it all happen!